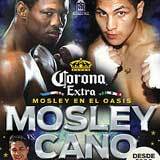 Review: 2013-05-18, some exciting rounds in the second part of the fight: Shane Mosley vs Pablo Cesar Cano gets three stars. The 23-year-old Pablo Cesar Cano ranked as the No.32 welterweight in the world, entered the fight with a record of 26-2-1 (20 knockouts) while the 41-year-old Shane Mosley had a record of 46-8-1 with 39 knockouts (Mosley is not ranked as he hasn’t fought since May 5, 2012 when he was defeated by Saul ‘Canelo’ Alvarez). Mosley vs Cano is valid for the vacant WBC International welterweight title. Watch the video!